Great news! 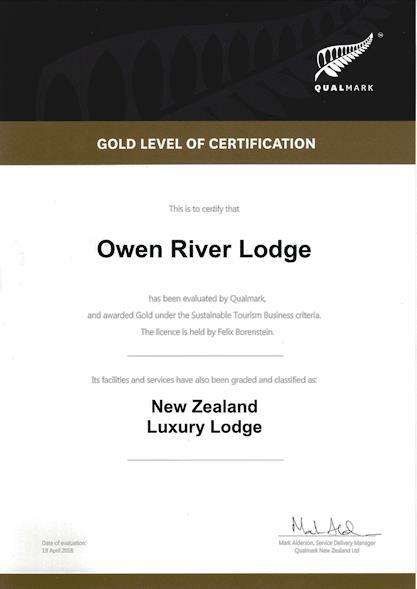 I am delighted to announce that Qualmark, the independent accommodation agency wholly owned by Tourism New Zealand, has just awarded Owen River Lodge its prestigious Luxury Lodge certification. This is the highest level of certification in New Zealand. We achieved this recognition because of our guests. They are the reason why we strive to deliver the very best in service, food, accommodation and—of course—fishing! The Owen River Lodge ethos has always been about delighting our visitors, exceeding their expectations and giving them wonderful memories to take home. So as far as we’re concerned, these awards belong to them as much as to us. We congratulate and thank them! We’re taking a little time to enjoy this achievement (we’re only human) but we have no intention of resting on our laurels. We’ve been officially recognised for our uncompromising standard of excellence. Now we plan to surpass it. If you’re planning to visit so that we can celebrate together, be quick! Word has got out and bookings for the 2018-19 season are filling fast.